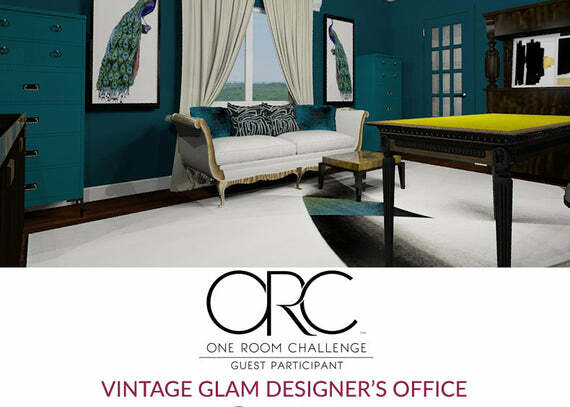 What is the One Room Challenge? Linda from Calling it Home created this challenge years ago for herself and friends to design and complete one room in 6 weeks. They are now on their 13th season! 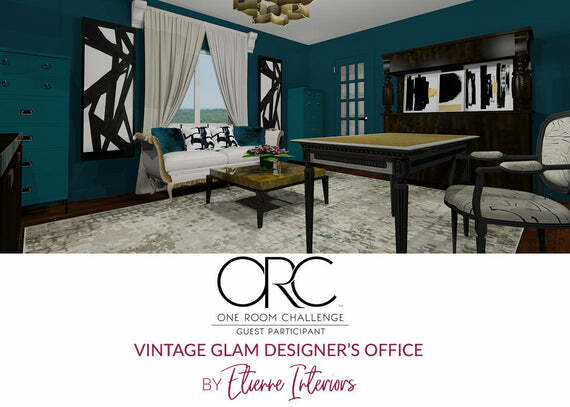 The challenge is now a bi-annual nationwide event that House Beautiful has partnered with ORC to follow 20 featured designers as well as guest participants like me! Oh how the weeks are flying by! Last week, I introduced you to some of the pieces I would be refinishing for the new office. Firstly, there was the credenza that I will be keeping in the space. My inspiration for the makeover of this piece was the Marlow Sideboard from Restoration Hardware Modern. I love the burnished brass detailing around the front of the sideboard. I thought that just this little bit of detail would liven up my credenza. Best of all, it was really simple to do. I have posted a RH inspired DIY tutorial on how I achieved the final look. Have a read if you would like to see how easy it is to add a bit of detail to your existing furniture for big impact. So spoiler alert, here is my new and updated credenza! There were a few challenges along the way, but overall I am happy with the results and again, super simple to do. I was able to complete another 2 pieces this week that I hadn't posted about yet. In my rendering, you'll see that I have 2 campaign style chests that will flank my Louis XVI desk. I am in love with campaign furniture! The hardware, straight and boxy styling make the pieces easy to integrate in any interior. These chests were an incredible find. I am giggling even as I am typing this. They were however not in great condition but I could see through the exterior bumps and bruises and knew I could bring these babies back to life. Take a look at the before photos. It was such a blessing to find a matching set of these. I just love how the 2 upper drawers have the double pulls. This adds a bit of horizontal visual interest to the otherwise tall and skinny chests. This paint colour is exclusive to their high-end paint line - Aura. This is a beautiful paint that I had not yet worked with. I'll tell you after using it, is will be difficult to use anything else! The application was so smooth and the coverage was amazing. I didn't even use a primer over the piece (it was well sanded however), and the adhesion was great. Even though the colour was rich and dark, I only needed two coats. I was also able to complete both chests with only 1 sample pot of paint as well, which made the makeover very economical. I will be posting a full DIY post regarding the steps I took to complete this project shortly. This paint colour is truly amazing. I counted at least 4 different shades from green through to blue throughout the day. Its a chameleon colour that really reacts to the space its in. This week, I was also able to find 2 pairs of vintage satin curtains for the room. They were custom made with pinch pleats and are in perfect condition from the cleaners! I am feeling so very lucky so far with this project, everything is falling into place. I will share a photo with you next week. My goals for the next week are to complete my Louis XVI desk refinishing, and also get started on stripping my french daybed that I will be reupholstering. That will be plenty to get done in one week so fingers crossed! Please come back weekly to check-in and see the progress on the room. As promised, I will also post separate DIYs for the refinishing projects in the room. Its going to be a lot of fun!